Nigerian midfielder Okechukwu Azubuike has expressed delight at making his debut for Turkish side Çaykur Rizespor on Saturday, describing it as a “great feeling”. 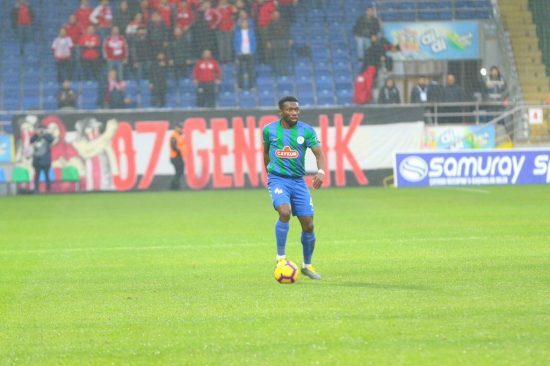 Azubuike made his first appearance for the modest Turkish Super Lig side, playing for 75 minutes in their 1-1 draw against Antalyaspor in the game during which another Nigerian, Aminu Umar went off injured in the first half. Azubuike joined the Turkish side last month on loan from Egyptian side Pyramids and told www.aclsports.com of his delight at playing in Turkey again. Azubuike played as a central defensive midfielder for his side before he was replaced in the 75th minute by Samu, the man he dislodged from the starting set up. The 21-year old hopes to get more game time as the season rolls by. “I’m hopeful of starting more games as we approach the business end of the season. For now, I had a good start and that’s very important,” added Azubuike. While he was reveling in his maiden appearance, it was not all happiness for Azubuike’s teammate and compatriot Aminu Umar – a star act in the Rizespor side. The forward suffered an ankle injury and was replaced before the half hour mark. “Umar doesn’t look too good when he was subbed off, he twisted his ankle. I hope it won’t be serious but we have to wait after a scan to see the level of injury he suffered,” said Azubuike. Rizespor will next face Bursaspor in the Super League on Saturday before hosting Azubuike’s former club Yeni Malatyaspor a week later.